Researchers in Japan have used a 3D bioprinted cellular patch to repair damaged human diaphragms attached to rats, seeing “complete tissue integration” of the printed grafts after a period of time. The exciting bioprinting research paves the way for a clinical trial. While scientific experiments on rats can be a little hard to stomach, research in the field of 3D bioprinting is highly dependent on the practice. Over the last few years, we’ve seen bioprinting experts—particularly those in Japan—make huge strides in their research by implanting 3D printed liver buds, and later 3D printed tracheas, into live rats. When these experiments go to plan, they represent hugely important steps on the road to transplantable bioprinted human organs—the end goal for many bioprinting researchers and companies. Two of the researchers responsible for those 3D printed liver buds, Koichi Nakayama (Saga University, co-founder and shareholder of Cyfuse Biomedical) and Tomoaki Taguchi (Kyushu University), have now returned with a new research paper, put together with other researchers from Kyushu and Saga. This new research attempts the 3D bioprinting and regeneration of a different body part: diaphragms. The bioprinting research has been carried out because of an urgent need within paediatric surgery to find ways to heal diaphragmatic hernias with the use of native tissue (tissue taken from other parts of a patient’s body). 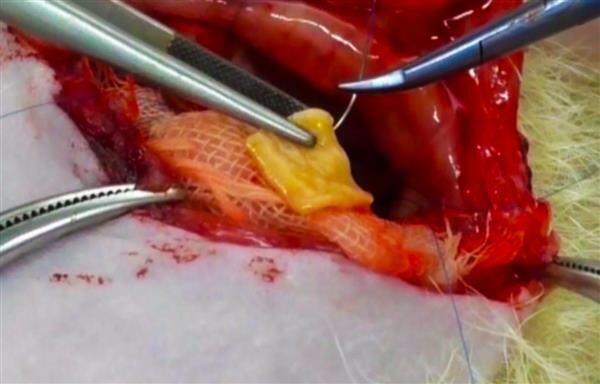 The current use of so-called “mesh” patches in medicine, which can consist of organic and inorganic materials, often results in a recurrence of the hernia, something doctors and patients want to avoid at all costs. Many of these meshes are also unable to function over a period of time, since they do not grow as a patient grows. By using a 3D bioprinter to generate large scaffold-free tissue patches composed of human cells (human dermal fibroblasts and human umbilical vein endothelial cells), the researchers attempted to repair damaged human diaphragms attached to rats.